The x3200 M3 supports the latest Intel Xeon quad-core and Celeron, Pentium, and Core i3 dual-core processors for exceptional performance. Because your organization must manage growing volumes of data while maintaining high performance, the x3200 M3 offers vast memory capacity and disk storage. To enable energy savings, the x3200 M3 provides high-efficiency power supplies (model dependent) and support for IBM® Systems Director Active Energy Manager™, an energy-usage monitoring tool. Note: This product has been withdrawn from marketing. The x3200 M3 supports the latest Intel Xeon quad-core and Celeron, Pentium, and Core i3 dual-core processors for exceptional performance. Because your organization must manage growing volumes of data while maintaining high performance, the x3200 M3 offers vast memory capacity and disk storage. To enable energy savings, the x3200 M3 offers high-efficiency power supplies and support for IBM® Systems Director Active Energy Manager™, an energy monitoring tool. Suggested uses: Small and medium businesses, distributed large enterprises, retail, banking, and insurance companies seeking scalability, top performance, and enterprise class availability features at an entry-level price. The System x3200 M3 features easy installation and management with a rich set of options for hard disk drives and memory. The efficient design helps to save energy and provide a better work environment with less heat and noise. Security features such as Trusted Platform Module 1.2 and management features such as the Virtual Media Key and the Integrated Management Module assist in meeting today’s complex desk-side environment. The economical price point and total cost of ownership make acquisition easier. 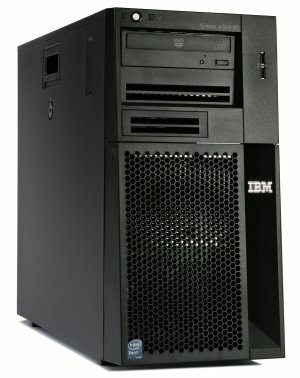 The single-socket System x3200 M3, incorporating IBM X-Architecture features, is an affordable, single-socket tower server that offers more performance, configuration flexibility and availability features than many other servers in its class. From network infrastructure to distributed applications to front-end workloads, the x3200 M3 is designed to meet a wide range of business needs and help you adapt to changing business requirements. Tower design that can be converted to a 5U rack system if needed. A choice of power supplies either one fixed 401 W AC power supply or two 430 W AC hot-swap redundant power supplies (model dependent). Storage bay flexibility: Up to four 3.5" simple-swap SATA HDDs, or up to four 3.5" hot-swap SAS/SATA HDDs, or up to eight 2.5" hot-swap SAS HDDs (model dependent). Additional internal optical drive bay and tape drive bay. Six total PCI Express 2.0 (PCIe 2.0) and PCI-X I/O slots for increased network or storage connectivity. One slot dedicated to the optional RAID controller. The x3200 M3 includes an Integrated Management Module (IMM) to monitor server availability, perform Predictive Failure Analysis, and trigger IBM Systems Director alerts. Text Console Redirection support allows the administrator to remotely view x3200 M3 text messages over Serial or LAN connections. The x3200 M3 servers offer ECC memory protection. This can help reduce downtime caused by memory errors. 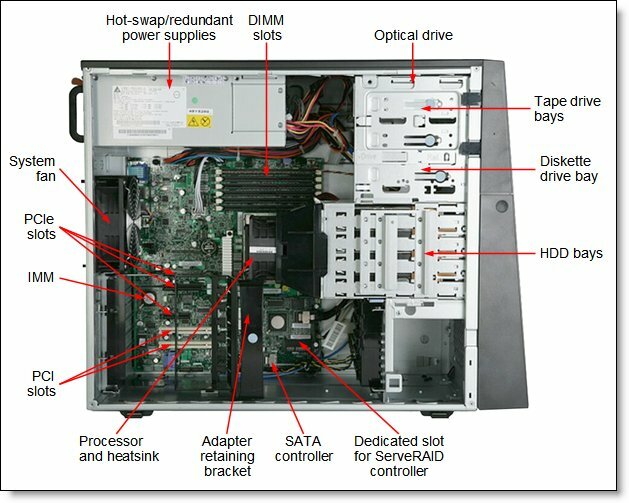 Certain models of the server offers the option of hot-swap and redundant power supplies and hot-swap disk drives (redundant when implemented in conjunction with a RAID controller). These features mean greater system uptime. The x3200 M3 uses hexagonal ventilation holes in the chassis. Hexagonal holes can be grouped more densely than round holes, providing more efficient airflow through the system chassis. This ultimately results in reduced operational costs. Form factor Tower (can be a 5U rack form factor using the optional Tower-to-Rack conversion kit). Memory capacity Up to 32 GB with 8 GB DDR3 RDIMMs and 4 populated DIMM slots, or up to 16 GB with 4 GB DDR3 UDIMMs and 4 populated DIMM slots. Dual-core processors only support UDIMMs. Disk drive bays Up to four 3.5" Simple Swap SATA HDDs, or up to four 3.5" Hot-Swap SAS/SATA HDDs, or up to eight 2.5" hot-swap SAS HDDs (model dependent). Maximum internal storage Up to 7.2 TB with 900 GB 2.5" SAS HDDs, or up to 12 TB with 3 TB 3.5" SATA HDDs. Intermix of SAS/SATA is not supported. RAID support No RAID support on integrated SATA controller (used on simple-swap standard models); RAID 0, 1, 1E with ServeRAID-BR10il v2 (used on hot-swap standard models). Optional RAID 5, 50 with M5014 or M5015. Optional upgrade to RAID 6, 60 is available for M5014/M5015. Optical drive bays One 5.25" HH bay, support for DVD-ROM or Multiburner. Tape drive bays One 5.25 HH bay, support for internal tape drive, DVD-ROM, or Multiburner. Network interfaces Integrated 2 port Gigabit Ethernet (Intel 82574L) / 1 port is shared with IMM. Ports Two USB 2.0 ports on front. Four USB 2.0, one DB-15 video, one DB-9 serial, two RJ-45 Gigabit Ethernet network ports (one is dedicated, one is shared with IMM) on rear. One internal USB port for embedded hypervisor. Cooling Three speed-controlled non-redundant fans. Power supply One fixed 401 W AC power supply or two hot-swap redundant 430 W AC power supplies (model dependent). Hot-swap components Hard drives, power supplies (model dependent). Video Matrox G200e integrated into IMM, maximum resolution is 1280x1024 @ 85 Hz. Operating systems supported Microsoft Windows Server 2008 R2 and 2008, DC/Windows Small Business Server 2008, Red Hat Enterprise Linux, SUSE Linux Enterprise Server, VMware ESX 4 and VMware ESXi 4 embedded hypervisor. Limited warranty 1-year (7327) or 3-year (7328) customer replaceable unit and onsite limited warranty with 9x5/next business day (NBD) response time. * Effective October 12, 2012, or until supply is depleted, IBM will discontinue the shipment of IBM Systems Director DVDs with System x servers and BladeCenter chassis. IBM Systems Director Express Edition and IBM Systems Director Standard Edition, which include software subscription and support, continue to be available for System x servers and IBM Blade Centers. Country-specific models might have one or two (depending on number of power supplies in the server) country-specific line cords. The following lists the standard models. ** Processor detail: Processor quantity, model, core speed, number of cores, L3 cache, front-side bus speed. † The x3200 M3 is available as machine type 7327 with a 1-year warranty or as machine type 7328 with a 3-year warranty. This is the only difference between systems of the same model (for example, comparing 7327-42x and 7328-42x). The following lists the express models. * Processor detail: Processor quantity, model, core speed, number of cores, L3 cache, front-side bus speed. ‡ 7328-PEX includes Windows Server 2008 R2 standard edition preinstalled on the three HDDs configured as a single RAID-5 array. Mixing of UDIMMs and RDIMMs is not supported. RDIMMs are only supported with Intel Xeon 3400 series processors. All DIMMs used in the x3200 M3 support ECC memory protection. The following table lists the RAID controllers and additional options used for internal disk storage of x3200 M3 server. The ServeRAID BR10il v2 RAID controller and ServeRAID H1110 occupy the dedicated PCI-E slot on x3200 M3 and does not consume regular PCI expansion slots. However, M1015, M5014, M5015, and MR10i RAID controllers occupy one of the standard PCI Express x8 Gen 2 slots, therefore limiting the maximum number of additional I/O adapter slots to 4. Only one RAID controller can be used with the server to support internal HDDs. The server supports the internal tape drive options listed in the following table. Internal tape drives are installed in a 5.25" HH bay. A maximum of one tape drive is supported. SAS tape drives require SAS HBA to be installed in server. USB tape drives are connected to the dedicated USB tape drive connector on the motherboard. If an internal tape drive is installed, then the maximum number of optical drives is limited to one. The server supports the optical drive options listed in the following table. 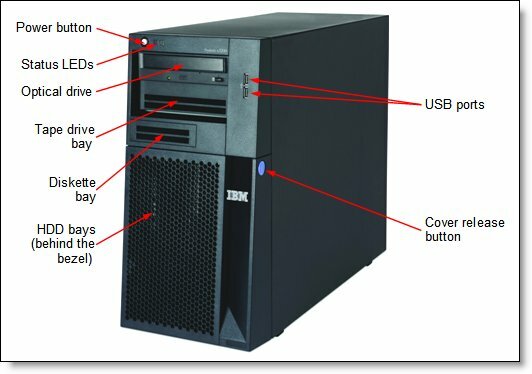 If two optical drives are installed, then an internal tape drive cannot be installed in the server. x3200 M3 supports two integrated Gigabit Ethernet ports. One port is shared with IMM. The following table lists the storage host bus adapters (HBAs) supported by x3200 M3 server. The server supports one fixed 401 W AC power supply or two 430 W AC hot-swap redundant power supplies (model dependent). Models come standard either with one fixed or two hot-swap power supplies. There is no need to order an additional redundant power supply, and such an option does not exist. The server contains IBM Integrated Management Module (IMM), which provides advanced service-processor control, monitoring, and alerting function. If an environmental condition exceeds a threshold or if a system component fails, the IMM lights LEDs to help you diagnose the problem, records the error in the event log, and alerts you to the problem. Optionally, the IMM also provides a virtual presence capability for remote server management capabilities. The System x3250 M3 has a 1-year (4251) or 3-year (4252) onsite warranty with 9x5/NBD terms. IBM offers warranty service upgrades through IBM ServicePacs. The IBM ServicePac is a series of prepackaged warranty maintenance upgrades and post-warranty maintenance agreements with a well-defined scope of services, including service hours, response time, term of service, and service agreement terms and conditions. The external disk storage expansion enclosure listed in the following table are supported with x3200 M3 server. * Note: The Advanced Feature Key and Performance Accelerator Key cannot be used at the same time. Only one key can be installed onto a RAID controller. * Note: The EXP3000 enclosures can be chained with each other. In such a case, one cable is used to connect first EXP3000 to the RAID controller, and every consecutive EXP unit is connected to the previous one by one cable. The server supports the rack cabinets listed in the following table. 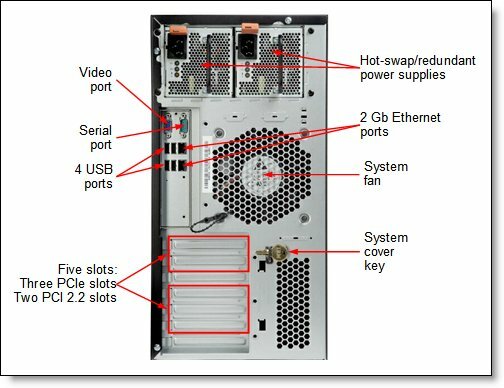 Tower-to-Rack Conversion Kit (part number 42C8923, 5Ux20" Tower to Rack Conversion Kit for x3200 M3) is required for the server to be installed in the rack.